On Saturday night 7 December 2013 our local community choir, Songlines, conducted by Bruce Knight, gave a concert at St Mary’s Church, in Leamington Spa, to raise money for Water Aid. It was a night where we saw and felt the power of music to bring joy and to uplift. A standing ovation and calls for an encore confirmed this. Our programme encompassed community choir arrangements of the moving Zulu song Egalile, full of exhuberant synchronized movements, including our well-rehearsed African shuffle; Let the River Run by Carly Simon, Sunday Morning by Reed & Cale, arr.Knight; the Beatles’ song Nowhere Man; Wake Up by Nick Prater arr. Ali Orbaum, and the Samoan song Fa’afetai i le Atua arr. Tony Backhouse. A smaller group called Extra-stronglines also sang the gorgeous harmonies of the Beatles’ song Because. A highlight was a performance of the South African National anthem Nkosi Sikeleli’l Afrika in tribute to the recent passing of Nelson Mandela. And at the end, we walked off the stage, singing Love is like a river, let it flow, let it flow, let it flow. Long may we celebrate the gift of music in our lives. Singing is a gift of God, and a channel for empowerment. This weekend has been an amazing time of singing. And I’ve learned a few things about this life too. On Saturday night, the choir I sing with, the Warwick & Kenilworth Choral Society, gave a performance of Bach’s B Minor Mass that truly honoured the composer’s purpose. This was against all expectations – our own, and those of the conductor. And yet, despite weeks of agony and doubt and struggle in rehearsal (plus the temptation, I suspect, for several singers, to give up) we succeeded. Not for a single rehearsal had the first sopranos ever sung it without getting lost. And yet, on the evening itself – we sang it all the way through, even the most difficult bits, and didn’t get lost. This experience has taught me, that whatever we dare to believe, sometimes God’s grace snatches success out of the most unpromising places. From a major choral work to a community choirs festival in Stratford-upon-Avon on Sunday. 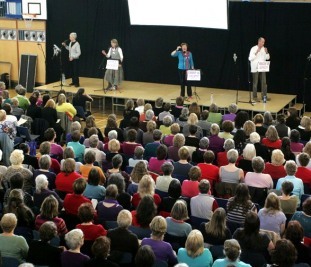 Here, a gathering of different community choirs from around England, all came together to learn some new songs, under the guidance of four Natural Voice Practitioners – dynamic, fun, energetic and inspirational. Untrammelled by inhibition, these gifted singing teachers gave of themselves for the joy of others. The whole day was a totally uplifting, empowering experience. Through a mixture of harmony songs – slave songs from the American south, songs from the Eastern orthodox church, or songs arising from Australian aboriginal or North American Indian spirituality, to “Price Tag” by Jessie J – the different choirs delighted with their singing. I was enthralled to watch the varied styles of the conductors. Some conducted in a tradiitonal manner, others danced and bopped around in from of their choir. And at the end the four teachers treated us to a hilarious and top-rate performance of the Beachboys’ song God Only Knows What I’d Do Without You. A wonderful life-enhancing weekend of singing! What or who would inspire you to start singing? Even if you’ve spent years of your life thinking you “can’t sing”? And there are many people with this gift – I’ve met quite a few in my own life of singing – but today I celebrate Gareth Malone. What a difference Gareth has made to the popular perception of choral singing, here among the British people! A nationwide choral singing boom is giving fresh meaning to the sound of music, with new choirs popping up at the fastest rate in decades. Increasing numbers of people are starting their own vocal groups, inspired by the nation’s new choirmaster-in-chief Gareth Malone, …. because they want to boost their wellbeing, mental or physical. I’ve sung in choirs since I was very young. I was first introduced to it by my father, a great choral singer himself – he held high-value currency, as a tenor. I sing in a number of different groups, and I love singing! 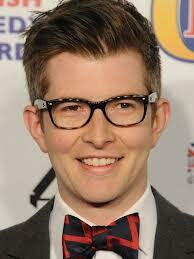 But, even with all that experience, I would still love to sing under the direction of Gareth Malone! Perhaps one day I’ll achieve that wish! I belong to the Warwick & Kenilworth Choral Society. Right now, we’re rehearsing to perform Bach’s Mass in B Minor in Leamington Spa in March. Personally, I can’t get enough of singing! 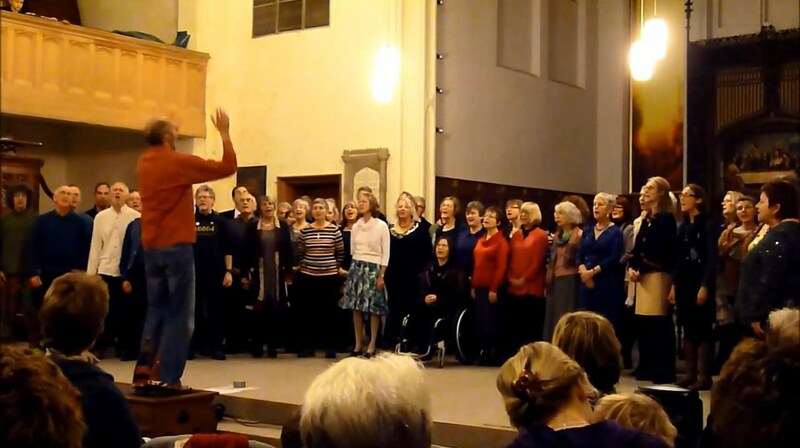 So now I’ve also joined a local Community Choir in Leamington Spa called “Songlines”. “Songlines” is one of many community choirs. They’re all linked into the Natural Voice Network. In a “community choir”, the singers stand in a circle, without having to follow printed music, and the leader is at the centre, teaching the lines of music by singing them, and the choir members pick up the music from this. The lines of music seem very easy to sing, you master them quickly, then the fun comes when the leader directs you to sing it, perhaps, as a round, accompanied by movement. He may divide the choir into 4-8 groups and get each group to stagger their entries. The sound of the voices blending is magical. And this – with the right direction – is really very easily achieved. The Guardian article above refers to “wellbeing, mental or physical”. To that I want to add “spiritual wellbeing”. Many different spiritual traditions have recognised this, and make full use of it. Bliss through sound, using the human voice, is part of the Buddhist and the Yoga traditions. Years ago I went to the Buddhist Centre in Bethnal Green, East London. There I joined weekly sessions of Buddhist chanting: an experience of joy and deep peace. The Yoga tradition, too, has fully understood the healing power of sound, incorporating yogic humming and chanting into their practice. Taize prayer , in the Christian tradition, also uses beautiful harmony singing, to achieve a similar sense of upliftment, and connection with God. I do this, too, every month, at St Peter’s Catholic Church Centre in Leamington Spa. Of course few experiences of body, mind and spirit can equal that of singing with a large choral society in Bach’s B Minor Mass – and, indeed, any other major choral work. Being part of this grand swell of sound can lift you right out of this world. So I celebrate Gareth Malone for spreading wide the love of choral singing and the knowledge that we can all sing – whether or not we currently believe so. What about you? Do you believe you “can’t sing?” Has Gareth Malone encouraged you to believe otherwise – or perhaps to join a singing group yourself? Or maybe you’ve already experienced joy through singing in a group, large or small? Have you been inspired by the work of Gareth Malone? 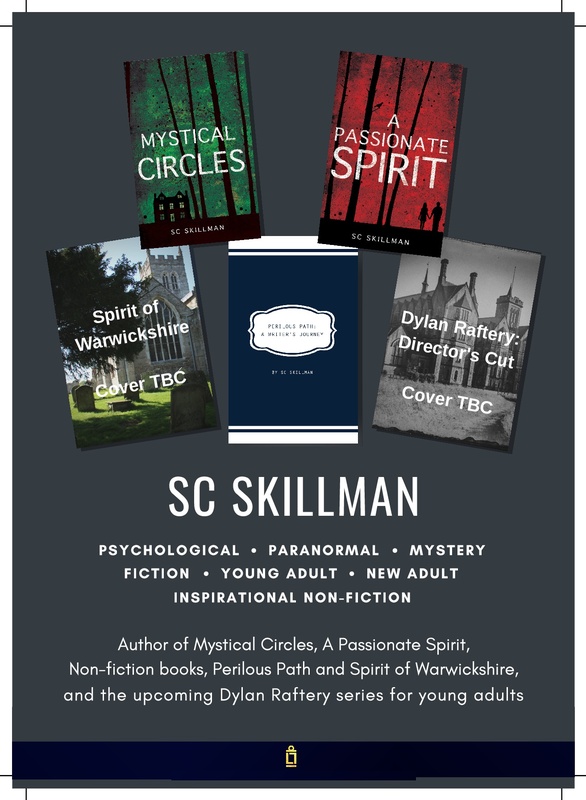 Let me know your experiences – I’d love to hear them!